Are your Dixon lawn mower spindles broken? Don't wait any longer to get them replaced. We have the spindle assembly, spindle housing, or spindle shaft you need to repair your mower deck spindles. 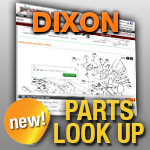 Match your model or part number below to find compatible spindles for your Dixon lawn mower.